American Girl's 2017 Girl of the Year(TM) Inspires Girls To Find Their Creative Voices And Speak Out To Make A Difference | Mattel Inc.
MIDDLETON, Wis., -- American Girl is ringing in the New Year with the debut of Gabriela McBride™, the company's new 2017 Girl of the Year™! Gabriela is a true creative talent who uses the power of poetry to help her break down barriers and overcome a personal challenge with stuttering. 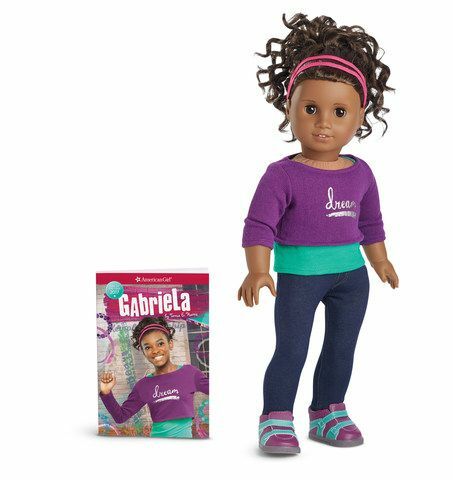 Gabriela comes to life for girls via a beautiful 18-inch Gabriela™ doll featuring curly dark-brown hair and warm brown eyes, an exclusive outfit that reflects her creative side, and a book chronicling her story. Gabriela also comes with several performance-inspired outfits and accessories, including a dance barre, rehearsal and dance outfits, plus pretend headphones and a microphone. Additional Gabriela products and books will be available starting in spring 2017, and—for the first time—the new Girl of the Year collection will be available for a full 12 months and beyond. To learn more about Gabriela and the Girl of the Year™ line, go to americangirl.com, Facebook at facebook.com/americangirl, Twitter at twitter.com/american_girl, Pinterest at pinterest.com/agofficial, and American Girl's Instagram page at instagram.com/americangirlbrand. To request an American Girl catalogue, call 1-800-845-0005. American Girl is a premium brand for girls and a wholly-owned subsidiary of Mattel, Inc. (NASDAQ:MAT, www.mattel.com), a creations company that inspires the wonder of childhood. Headquartered in Middleton, WI, American Girl offers an inspiring world of dolls, content, and experiences that nourish a girl's spirit and help develop her strength of character. Best-selling lines include Truly Me™, Girl of the Year™, Bitty Baby™, WellieWishers™, and the classic historical character line BeForever™. The company sells products through its award-winning catalogue, on americangirl.com, in its proprietary U.S. experiential retail stores, and at select specialty retailers nationwide. Outside of the U.S, American Girl products are sold in specialty boutiques at select Indigo™ and Chapters™ in Canada and El Palacio de Hierro locations in Mexico City. By inspiring girls to be their best, American Girl has earned the loyalty of millions and the praise and trust of parents and educators. Gabriela McBride, American Girl's 2017 Girl of the Year.